19 September 2016, Bhubaneswar: Odisha Transport Minister, Ramesh Chandra Mahji, Bhubaneswar Development Authority (BDA) Vice Chairperson, Dr. Krishan Kumar (IAS), and supermodel and actor, Milind Soman spoke at the inaugural session of India Vision Zero on 18 September 2016. The event, organized by WRI India Sustainable Cities and BDA, in partnership with Bloomberg Initiative for Global Road Safety, was held to discuss challenges, opportunities, and solutions towards reducing road traffic fatalities in India. The theme of the event was Safer Streets, Safer Cities, and was held on 18-20 September in Bhubaneswar. “With only 2 percent of global motor vehicles, India accounts for over 10 percent of global road traffic deaths. We need a comprehensive approach to address road safety” said Mr. Mahji. “We need to improve blackspots, and create awareness about road safety in order to build a smart city”. “Road safety is an outcome of good urban planning and design. Since the launch of the mart city programme, Bhubaneswar has been aiming to design a city that’s safe for children. If streets are safe for our children, they’re safe for all” said Dr. Kumar, highlighting the various initiatives by the city to improve road safety following the numerous road traffic accidents in the past. In the last decade or so, over a million people have died owing to road traffic crashes in India, accounting for more than 10 percent of global numbers. A majority of victims are in the age group of 15 to 45 years. This means, each year, India loses around two to three percent of its GDP owing to road traffic crashes as fatalities or serious injuries result in people leaving the workforce. Although the United Nations declared 2011-2020 as the UN Decade of Action for Road Safety, and several Indian cities have undertaken initiatives to improve road safety, our numbers haven’t decreased. In 1997, Sweden introduced a Vision Zero approach to road safety. By 2000, they had reduced their numbers by half. This approach uses the basic principle that if transportation systems are designed to be safe for the most vulnerable user, then they will be safe for all users. At the inaugural session, the dignitaries present reiterated their commitment to improving road safety by unveiling a plaque outlining the key principles of Vision Zero. The Vision Zero approach pegs human life and health as more important than all other transportation challenges. When cities plan roads and systems to solve issues of congestion, traffic flow or road capacity, the safety of all road users – including pedestrians and cyclists – must be the highest priority. Transportation systems, including roads and vehicles, must be designed taking into account that people make mistakes, so that when crashes occur owing to human error, it does not result in fatalities or serious injuries. Road authorities and road users are jointly responsible for safety. When system designers, enforcers, and users share responsibility, there is greater synergy between the design of transportation systems and human behaviour, thus increasing safety. All stakeholders must work together to improve road safety. An effective strategy towards improving road safety requires co-ordination at different levels and across various departments, including road and transport authorities, police departments, legal bodies, medical aid providers, and others. Milind Soman, passionate about active modes of transport like walking and cycling spoke from his experiences of various cities, like Mumbai, Delhi, and others where it’s often unsafe for pedestrians. "A safe city is a healthy and an active city. Safe streets for pedestrians and cyclists mean safe streets for all” he said. India Vision Zero saw representation from the Centre, States, cities and other stakeholders, such as civil society, media and sector experts, who came together over the course of two and a half days to deliberate on concerns, ideas and strategies for road safety reform in the country. Other key speakers included Mr. RK Singh (IAS) Director of Urban Transport, Ministry of Urban Development, Government of India, Mr. Chandra Shekhar Kumar (IAS) Transport Commissioner, Odisha, Prof. Sewa Ram, School of Planning and Architecture, Delhi, Ms. Claudia Adriazola, Director, Health and Road Safety, WRI Ross Center for Sustainable Cities, Ms. Charlotte Berglund, Traffic Safety Expert, Sweco International, Sweden, and Mr. V Ravichandar, Civic Evangelist, Bangalore. 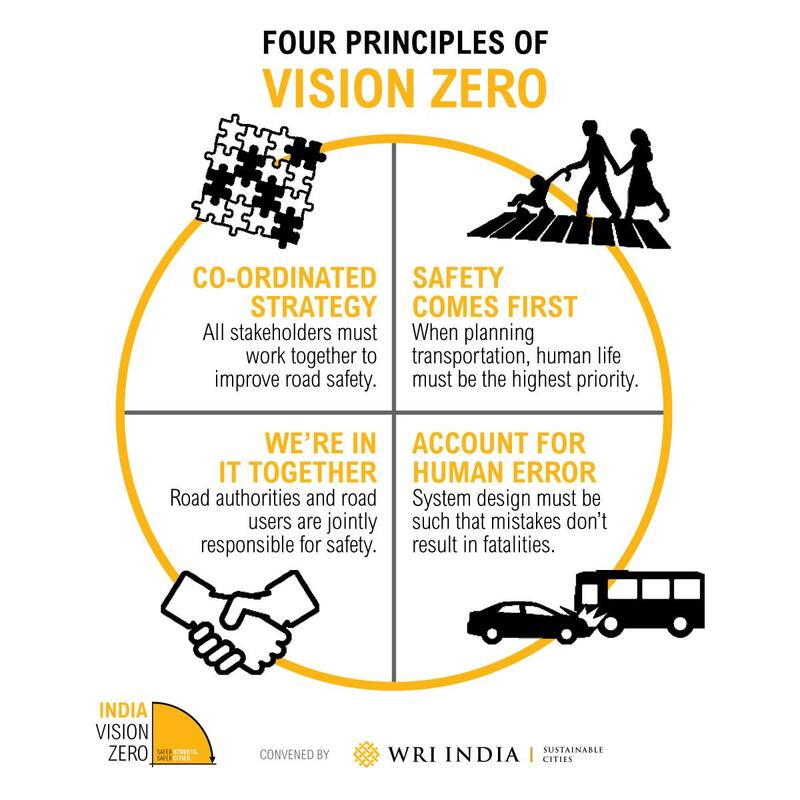 India Vision Zero aims to create a coalition of informed stakeholders, committed on working towards the goal of zero road fatalities in the country.